We here at DREAM Trust, which is a charitable institution, work in our small way, towards making the life of diabetic children especially female diabetics, more bearable and more meaningful. The main object of the Trust is to help poor children with diabetes. People at large, in India, are not medically insured and have to buy insulin injections, syringes and other accessories required for treatment. Poor families find it difficult to commit a quarter of their monthly income for the medicine and healthcare required by a diabetic child. This is why they try to find short cuts which they wrongly believe will make treatment less expensive. Debilitating, social, cultural and economic factors in India continue to discriminate against women and girls in appalling ways. This is why, the trust gives just and deserving priority to girls. This project of sponsoring these children was conceived after we experienced two shocking incidents of losing diabetic girls. Parents of these girls had stopped giving insulin as they simply could not afford it any longer. 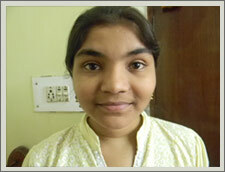 Sudha was eight years old and had just been diagnosed with type 1 diabets when I met her. When she was discharged from the clinic, I counselled her parents. I explained them about insulin and its importance for survival. I found Sudha’s poor and illiterate parents very attentive to what I said. Finally her father asked me, "Doctor, if I understand you correctly, does Sudha have to take insulin everyday for the rest of life ?" I nodded, "Yes". "What would happen", he went on, "if she stopped taking insulin?" "Well, she would go into a coma", I explained, "and if left unattended she would die". He nodded calmly and had clearly understood everything I said. I was happy that my counselling had had the desired effect. I gave Sudha a pat on the head and she left the clinic with her parents. One month later, I learnt that Sudha had died. Her father had quite intentionally stopped giving her insulin, knowing very well what the result would be. The logic of poverty had overpowered the logic of life. Kalpana and Sudha were not the only ones; there were many more shocking and disheartening cases of this kind that my wife-Swati-and I decided to form an organization to help prevent further tragedies and this was how DREAM Trust was born. The Trust has so far sponsored over 1300 type 1 diabetic children. They are given free insulin, syringes, monitoring strips, glucometers and their health is monitored. Such exercise which is so awesome in magnitude cannot remain a burden on just a few and still hope to reach anywhere. This is simply because much more welcome contributions coming in, more number could be benefitted. In order to make these children self reliant, the trust believes that education is the key to eradicate poverty. 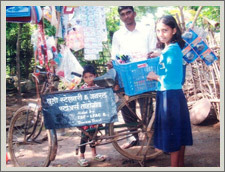 Trust gives educational scholarships to these under privilege diabetic children, provide bicycles to enable them to go to school situated at a distance from the village. 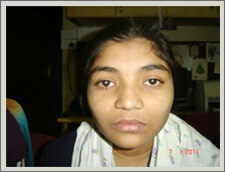 Dream Trust has so far carried out 15 such Cataract surgeries . In the above picture, S.D. 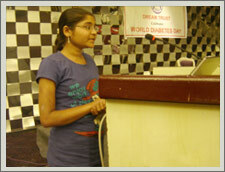 after her vision restoration is seen thanking Dream Trust during World Diabetes day celebrations. In the above picture, hearing aid machine which costs about Rs. 20,000 for both the ears were provided with the help of this project from Dream Trust to one of our female child patient L.D. 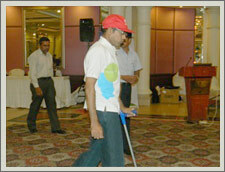 One of our Type 1 diabetic patient who had undergone Hip disarticulation right 12 years back. Dream Trust decided to provide him special German Prostheses from Otto Bock . This is the most difficult prostheses and is made of Titanium. 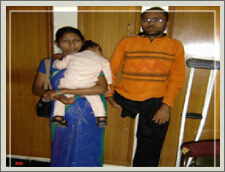 We raised money for his prostheses from the proceeds of the Workshop on Diabetic foot organized at Nagpur on 21st and 22nd April 2012. This patient had undergone training and started walking everyday 2 kms without crutches and is enjoying playing with his children . He climbs staircase easily and he finds total change in his approach to life . 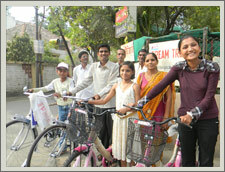 The Dream Trust also helps to rehabilitate and promises the children a better future. Under this rehab program, Dream Trust had so far donated 80 bicycles to Type 1 needy children to enable them to go to school situated at a distance from the village. 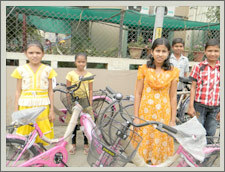 This bicycle Project has surely checked school dropout percentage among the female children. The Trust had so far given educational scholarships to 315 needy children. The Scholarship amount ranges from INR 2000 to INR 40000. Total Amount of Grant given by Dream Trust after launching this project is around INR 17.5 lakhs . Trust has so far provided financial assistance to 80 needy Type 1 Diabetics to start up their own business like screen printing , setting up a Fruit shop, artificial jewellery business etc.,. Total Amount of Grant given by Dream Trust after launching this project is around INR 13.5 lakhs . It has also given financial assistance for vocational training to some girls for doing nursing course and some for pursuing beauty parlour course. 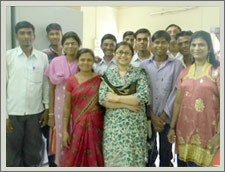 Trust also promotes , supports vocational training for grooming boys & girls and help them to set up a small business. 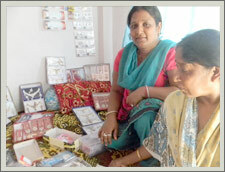 One of our patient was supported for setting up an artificial jewellery and selling undergarments. During one of our home visit, she is seen at her residence with a range of products which she has displayed for sale in the available space. In the above picture , patient is seen displaying the products. 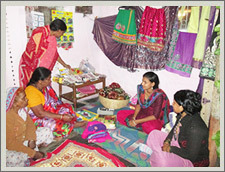 In the above picture, one of her customer is purchasing some of her products. A.P. is sponsored by IDF (Australia) . Under this Rehab program, he was supported for buying a buffalo. Instead of selling milk directly, A.P. makes other dairy products like ghee, curd, butter with the help of his mother which gives him good profits , after managing the daily requirements of buffalo. In the above picture, A.P. is seen with his buffalo. In the above picture, N.S. 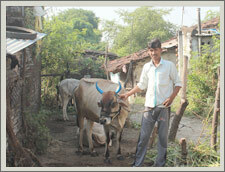 is seen with his cow donated under this project. Another beneficiary of this project S.M. 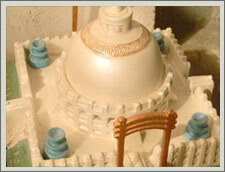 is supported to expand her business of making gift items made from Plaster of Paris. 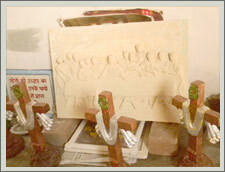 We got few photographs of her great work when we visited her home for follow up. Above pictures are some of the gift items made by her. Above picture shows some of our beneficiaries along with our Project coordinator Mrs. Seema Chalkore in the middle and our Educator Chanda. Dream Trust has so far supported 80 people for setting up their own business which had surely boost their confidence and made them self reliant. Under this Rehab Program, Dream Trust has so far donated 25 sewing machines to female diabetic patients. 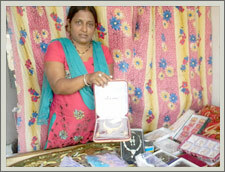 PU is seen selling bangles and her dress materials, garments from her shop opened at her home. 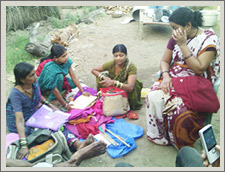 RS is seen selling sarees to the villagers by travelling to the nearby villages. In the above picture, P.S. is seen stitching clothes with the help of sewing machine donated by Dream Trust..
You can help us by donating funds, sponsoring a diabetic child or by sending healthcare products for these children or you can just become a friend of DREAM Trust.